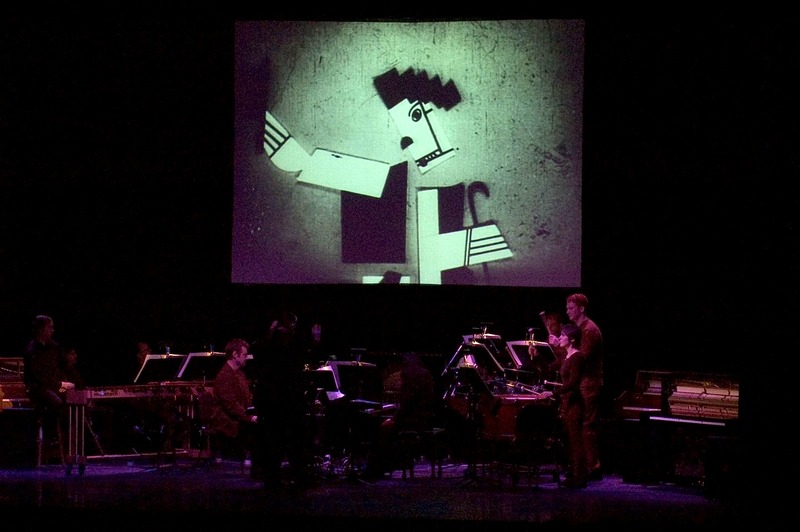 On January 30, 2005, at the State Theater in downtown Ithaca, New York, Ensemble X, under the direction of Steven Stucky (who was to win the Pulitzer Prize in composition later that year), performed Antheil's Ballet mécanique as the Léger/Murphy film was shown behind them. It was part of the city's 2005 Light In Winter festival, whose theme was "Dance of the Machines," and featured performances by the Kronos Quartet, the Galumpha Dance Company, Paul Winter Consort, and many more. Here is a great preview from the Ithaca Journal. Interestingly, the writer of this article is the granddaughter of Paul's first bassoon teacher, and the daughter of his one-time camp counselor—who now happens to be the president of the Juilliard School of Music! 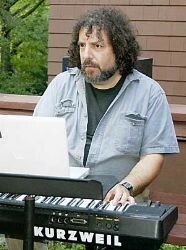 Electronic musician Paul Lehrman, shown playing during a summer jam session at his home, will perform the music of George Antheil's "Ballet Mécanique" on Jan. 30 in the State Theatre during the 2005 Light in Winter Festival. Ithaca College students, music professionals, and electronic music buffs are invited to Ithaca College's Iger Lecture Hall at 11 a.m. Sunday, Jan. 30, to learn how Paul Lehrman used MIDI technology to successfully orchestrate the first performance of George Antheil's original version of "Ballet Mécanique." Lehrman will also screen a documentary about the life of George Antheil and the making of "Ballet Mécanique" at 12:30 p.m. on Jan. 30 in Hockett Family Recital Hall at Ithaca College. ITHACA -- Paul Lehrman specializes in making previously unplayable music playable -- literally. For more than 30 years, Lehrman has created electronic music, using cutting-edge technology to help create his unique sounds. A music lecturer at Tufts University in Medford, Mass., Lehrman will be one of 11 speakers and performers participating in the 2005 Light in Winter Festival, to be held Jan. 28-30 at venues throughout downtown Ithaca, and at Cornell University and Ithaca College. Explaining his own work, Lehrman said that for 40 years, composer George Antheil's 1924 work, "Ballet Mécanique," remained unplayable due to its complex orchestration. "The original score requires the simultaneous playing of 16 pianolas (player pianos), a gong, three airplane propellers and a siren," Lehrman said. Antheil never lived to hear his piece come to life the way he originally intended because he learned, shortly after composing the piece, that it was impossible to synchronize 16 pianolas to play at precisely the same time, as was required by the orchestration of the piece, said Lehrman. But in 1999, Lehrman did the previously impossible. He used MIDI -- musical instrument digital interface -- technology to successfully perform the 1924 version of "Ballet Mécanique" for the first time ever by digitally linking the 16 pianolas required for the piece. Lehrman's long career in music started early. "My interest in electronic music began as a high school student living in Long Island," he said. "I built my first theremin (an electronic console-like instrument) from a kit -- it didn't work very well -- and produced tape collages in my parents' living room with a Steinway piano, a Hagstrom electric guitar, a Sony three-head reel-to-reel tape deck, and two Lafayette Radio microphones," Lehrman says on his Web site, www.paul-lehrman.com. As a young musician, Lehrman was an accomplished player of more than eight instruments and appreciated styles of music ranging from classical composers like Mozart to more modern artists like The Doors. Soon after graduating from high school, Lehrman decided to seriously pursue his interest in electronic music. "I went to Columbia University," he said, "but after 2-1/2 years, I realized there was not a large audience for this kind of music." Concerned about entering a field of music that was not viable for the long-term, Lehrman decided to return to more traditional musical training at the State University of New York at Purchase where he graduated in 1975 with a bachelor's degree in orchestral performance on the bassoon and contrabassoon. "Right after I finished my degree in Purchase, I returned to my passion for digital music," Lehrman said. For Lehrman, the introduction of the MIDI in 1983, later used in performing "Ballet Mécanique," changed the world of electronic music and allowed musical scores to be composed and orchestrated that had previously been impossible. "It created the electronic music explosion." said Lehrman of MIDI technology. "It allowed music from different manufacturers to talk to one another." Paul Lehrman is a music technologist, writer, composer, college lecturer and public speaker. More information about Lehrman and his life can be found at www.paul-lehrman.com. Copyright ©2005 The Ithaca Journal. All rights reserved.